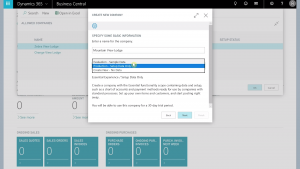 Today, we will be looking at how to set up a new company in Dynamics 365 Business Central. Many businesses run in scenarios where various legal entities take care of different aspects of your business. One entity is perhaps managing your manufacturing processes; another entity takes care of logistics and supply chain. Running multiple companies / legal entities in a single application can be cumbersome and some software applications simply do not cater for intercompany transactions. 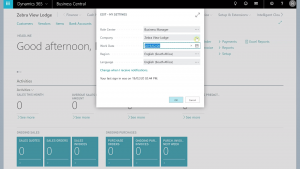 Dynamics 365 Business Central allows you to run multiple companies on the same tenant. This keeps all the information for the multiple companies in one easy to access platform. Convenience at your fingertips. We don’t limit you but rather we support you as your business grows and you acquire or open more companies. All you will need is one Business Central environment to run all these separate entities from. To set up a new company in Business Central is a quick and painless process and in this blog, we take a look at how easy it is. For this blog, we created a company called ‘Zebra View Lodge’. This will be the company from which we will be operating from. In this scenario, Zebra View Lodge had just acquired the neighboring farm and now we need to bring that farm in as a new company. To check which company you are logged into, you select the ‘My Settings’ tab and voila! You will be able to tell from which entity you are currently working and you can also then switch companies to go into your other businesses to carry out some tasks. By hitting the assist-edit icon as shown in the image below, you can view all the current companies. We have Zebra View Lodge and Orange View Lodge in our ‘current company’ section, but you will see any and all the companies that you have in your name. Currently, we have Zebra View Lodge as well as Orange View Lodge. You would have one company which is the current company you are logged in as. 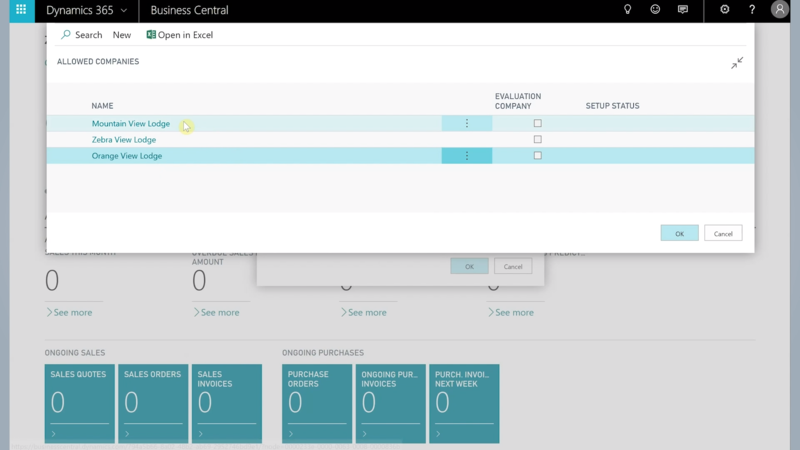 To create the new company, you will just select ‘New’ in the top menu bar, and Business Central will guide you through the ‘new company setup’. You will have options to create a company with sample data if you are wanting to do some testing, but for the sake of this blog, we will just create a new company with no added data or information. Once you have added the name of your company and selected your ‘Data and Setup’ option, you can click next to proceed to the next step. You will not have the option to set up the users and assign roles for the new company, but you can always come back after the company is set up to create users and allocate roles. Once that is done, you can select ‘Finish” and give the system a minute or two to initiate setup. The new company will appear on the allowed companies list and immediately will be made available. As you can see in the example below, the new company ‘Mountain View Lodge’ has been created and is available for us to begin working on it. If you select this new entity, in the case of our example we will select our new company called ‘Mountain View Lodge’, Dynamics 365 Business Central will refresh and log you into the newly created company. Now you would have two options with further setup; manual setup or assisted setup. When you set up a new company with Business Central, you can choose between assisted and manual setup. The assisted setup allows you to set up your new company using predefined setup screens and guides which make it easy to complete processes such as migrating business data, seeing up forecasts, email or simply setting up your VAT. For example, when ‘Migrate Business Data’ is selected, you can see how easy it is to manage your data migration process and follow the process each step of the way. Another example would be the ‘Cash Flow Forecasting’. With Business Central taking you through an easy to use step by step guide, you would have this forecast setup in no time. This applies to all the steps and processes you would need to go through in order to set up the new company. Business Central has predetermined processes to help make business easier with whatever you need to do in the setup. For those who are more familiar with Business Central and how to run through the processes, you can select ‘Manual Setup’. 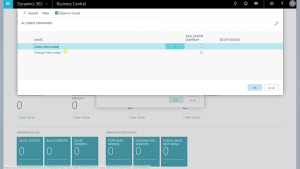 You would have more items visible when contrasted to the assisted setup processes. This allows you to see everything you need to have set up for your new company without the prompted predefined processes and steps. You have the freedom to set up a new company yourself. If you want to start using Microsoft Dynamics 365 Business Central, reach out to us on email, or via our website, or on social media. Dynamics Africa has the largest channel of experienced Dynamics partners on the African continent. With decades worth of experience in a variety of industries, our partners have what it takes to get you up and running in no time!